A new Vehicle to Grid (V2G) service for electric vehicle drivers at home and/or the workplace has been launched by DriveElectric. A UK provider of leased ultra-low emission vehicles, DriveElectric’s new V2G service aims to help balance the National Grid’s energy demands, by using an electric vehicle as a power buffer. In return, owners can make a return by selling energy back to the grid, the company says. 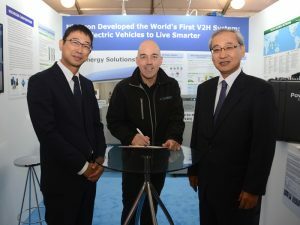 DriveElectric and Nichicon Corporation signed a Memorandum of Understanding at the Cenex Low Carbon Vehicle Event (LCV2017) in early September. Nichicon is the maker of vehicle to home hardware that has been on sale in Japan in conjunction with Nissan and enables owners to power their home using their car, for example in off-grid or power shortage scenarios – or simply to reduce energy bills. The hardware makes use of cars like the Nissan Leaf’s CHAdeMO DC rapid charging port, which provides direct access to charge or draw power from the battery. DriveElectric says they see V2G technology as vital to ensure the grid can satisfy the demands made upon it by an increase in plug-in vehicles. DriveElectric’s CrowdCharge platform, developed in conjunction with the University of Reading, uses machine learning and artificial intelligence to optimise charge sessions for EV owners, the company says, and that the system manages large numbers of plugged-in electric vehicles as a single large battery to support the grid. The company adds that V2G could play a pivotal role in, “decentralisation and the greening of the UK electricity supply chain”. DriveElectric’s V2G service will be made available in summer/autumn 2018, for CHAdeMO equipped vehicles, including the Nissan Leaf, Mitsubishi Outlander PHEV and Kia Soul EV. The price for vehicle to grid chargers is expected to be between £8,000-£9,500, while a return of between £300-800 per year initially is anticipated.